The team currently known as the Dodgers was formed (as the "Brooklyn Grays") in 1883 by real estate magnate and baseball enthusiast Inter-State Association of Professional Baseball Clubs that first season. Doyle became the first team manager, and they drew 6,000 fans to their first home game on May 12, 1883 against the Trenton team. The Grays won the league title after the Camden Merritt club disbanded on July 20 and Brooklyn picked up some of its better players. The Grays were invited to join the American Association for the 1884 season. The team name, Brooklyn Trolley Dodgers, was coined in 1895. The nickname was still new enough in September 1895 that a newspaper could report that, "'Trolley Dodgers' is the new name which eastern baseball cranks [fans] have given the Brooklyn club." In 1895, Brooklyn played at Eastern Park, where they had moved early in the 1891 season when the second Washington Park burned down. Some sources erroneously report that the name, "Trolley Dodgers," referred to pedestrians avoiding fast cars on street car tracks that bordered Eastern Park on two sides. Eastern Park, however, was not bordered by street-level trolley lines that would have been "dodged" by pedestrians. Eastern Park was served directly only by an elevated railway. The name, "Trolley Dodgers," implied the dangers posed by trolley cars in Brooklyn generally, which had recently (beginning in 1892) been switched from being horse powered to the much faster (and hence regarded as more dangerous) electrical power. The name was soon shortened to Brooklyn Dodgers. Other team names used by the franchise that would finally be called "the Dodgers" were: the Grays, the Grooms, the Bridegrooms, the Superbas and the Robins. All of these nicknames were used by fans and newspaper sports writers to describe the team, but not in any official capacity. 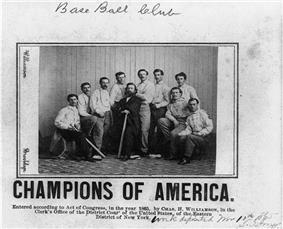 The team's legal name was the Brooklyn Base Ball Club. However, the "Trolley Dodgers" nickname was used throughout this period (along with the other nicknames noted) by fans and sports writers of the day. The team did not use the name in any formal sense until 1932, when the word "Dodgers" appeared on team jerseys. The "conclusive shift" came in 1933, when both home and road jerseys for the team bore the name "Dodgers". Examples of how the many popularized names of the team were used interchangeably are available from newspaper articles from the period before 1932. A New York Times article describing a game the Dodgers played in 1916 starts out by referring to how "Jimmy Callahan, pilot of the Pirates, did his best to wreck the hopes the Dodgers have of gaining the National League pennant," but then goes on to comment, "the only thing that saved the Superbas from being toppled from first place was that the Phillies lost one of the two games played." Most baseball statistics sites and baseball historians generally now refer to the pennant-winning 1916 Brooklyn team as the Robins. A 1918 New York Times article does use the nickname Robins in its title "Buccaneers Take Last From Robins," but the subtitle of the article reads "Subdue The Superbas By 11 To 4, Making Series An Even Break". "Uncle Robbie” and the "Daffiness Boys"
Manager Wilbert Robinson, another former Oriole, popularly known as “Uncle Robbie", restored the Brooklyn team to respectability. His "Brooklyn Robins" reached the 1916 and 1920 World Series, losing both, but contending perennially for several seasons. Charles Ebbets and Ed McKeever died within a week of each other in 1925, and Robbie was named president while still field manager. Upon assuming the title of president, however, Robinson’s ability to focus on the field declined, and the teams of the late 1920s were often fondly referred to as the "Daffiness Boys" for their distracted, error-ridden style of play. Outfielder Babe Herman was the leader both in hitting and in zaniness. The signature Dodger play from this era occurred when three players—Dazzy Vance, Chick Fewster, and Herman—all ended up at third base at the same time. (The play is often remembered as Herman "tripling into a triple play," though by rule only two of the three players were declared out and Herman was actually credited with a double rather than a triple.) After his removal as club president, Robinson returned to managing, and the club’s performance rebounded somewhat. 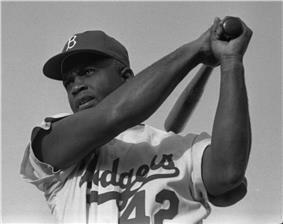 In 1955, by which time the core of the Dodger team was beginning to age, "next year" finally came. The fabled "Boys of Summer" shot down the "Bronx Bombers" in seven games, led by the first-class pitching of young left-hander Johnny Podres, whose key pitch was a changeup known as "pulling down the lampshade" because of the arm motion used right when the ball was released. Podres won two Series games, including the deciding seventh. The turning point of Game 7 was a spectacular double play that began with left fielder Sandy Amoros running down Yogi Berra’s long fly ball, then throwing to shortstop Pee Wee Reese, who doubled up a surprised Gil McDougald at first base to preserve the Dodger lead. The Dodgers won 2–0. ^ "1877 Hartford Dark Blues – Statistics and Roster". Retrieved 2008-09-22. ^ Okrent, Daniel (1988). The Ultimate Baseball Book. Boston, USA: Houghton Mifflin Company. p. 352. ^ a b Brown, Peter Jensen. "The Grim Reality of the Trolley Dodgers". Early Sports 'n Pop-Culture Blog. Retrieved 13 June 2014. ^ The Roanoke Times. September 13, 1895 http://chroniclingamerica.loc.gov/lccn/sn86071868/1895-09-13/ed-1/seq-2/;words=Trolley+dodger?date1=1891&sort=date&date2=1896&searchType=basic&state=&rows=20&proxtext=trolley+dodgers&y=0&x=0&dateFilterType=yearRange&index=0. Retrieved 23 November 2012. ^ Brown, Peter Jensen. "Rail Service to Eastern Park Brooklyn". Early Sports 'n Pop-Culture Blog. Retrieved 13 June 2014. ^ "Dodgers Timeline". Los Angeles Dodgers. Retrieved 2008-09-22. ^ "Brooklyn Ball Parks". BrooklynBallParks.com. Retrieved 2008-10-09. ^ "Dressed to the Nines uniform database". National Baseball Hall of Fame. Retrieved 2008-10-08. ^ Bernado, Leonard; Weiss, Jennifer (2006). Brooklyn By Name: From Bedford-Stuyvesant to Flatbush Avenue, And From Ebbets Field To Williamsburg. New York: New York University Press. p. 81. ^ "Buccaneers Rout Sleepy Superbas" (PDF). New York Times. 1916-09-14. Retrieved 2008-10-08. ^ "Buccaneers Take Last From Robins" (PDF). New York Times. 1918-05-19. Retrieved 2008-10-08. ^ a b c d e f g h i j "Dodgers Timeline". Los Angeles Dodgers. Retrieved 2008-09-22. ^ "Branch Rickey, 83, Dies in Missouri". The New York Times. Retrieved 2008-12-29. ^ "1955 World Series: Rare, Never-Seen". LIFE.com. ^ "Los Angeles Dodgers Baseball". 2006. Retrieved 2008-09-22. ^ Sullivan, Neil J. The Dodgers Move West. ^ "Giants 5 Dodgers 6 (Boxscore)". Baseball Reference. Retrieved 2009-11-10. D’Agostino, Dennis; Crosby, Bonnie. Through a Blue Lens: The Brooklyn Dodgers Photographs of Barney Stein, 1937–1957. Triumph Books.